About two and a half weeks ago, some exciting news hit the interwebs: researchers from the University of Texas at Dallas had made artificial muscles from nylon monofilament line. All it takes to turn a simple strand of plastic into a device that can push and pull is a particular method of twisting; once formed into shape, the line will contract when heated and expand back to its old shape when cooled. There are numerous articles on the discovery, but my personal favorite is this very complete offering from io9: Scientists Just Created Some of the Most Powerful Muscles in Existence. This video from SciencePlanetMedia is also informative: Artificial Muscle Science. Artificial muscle materials have been around for a while, but these are exceptional in that they sound as though they could be easily made by a hobbyist, using cheap materials. I can't resist. This month's project will be to see if I can duplicate the work of this research team and make some artificial muscles of my own. I'm ready to claim a tentative success on Phase I of the project: creating a fishing line muscle and getting it to respond to heat. Today I made and tested both a homochiral muscle (contracts when heated) and a heterochiral muscle (expands when heated). Lessons learned in the process are written below for your edification. D'Artagnan inspects the finished homochiral muscle. The first step in creating one of these muscles is to properly twist the filament. As the filament is spun, only simple twists will be visible at first; but eventually, secondary loops will begin to form. (You can see an up-close demonstration in one of the videos from the io9 article.) You have to twist the filament until it is all done up in these secondary loops, for this structure provides the magic that makes the muscle move linearly, instead of torsionally. Sounds simple enough, right? The problem could be my materials. I'm not using fishing line of any of the widths specified in the researchers' work. I'm using some cheap nylon beading cord of unspecified diameter, made by Cousin. It's pretty thin, and has a test strength of only 8 lb. (3.6 kg). I'll have to try the process again with some thicker, better-quality cords. But until I get them, I've found a workaround. It's based on the same technique you would have to use anyway, if you wanted a muscle type that expands when heated. Start by doubling the filament to make it stronger, putting one paperclip inside the doubled end and tying the two loose ends together around another paperclip. Use non-insulated paperclips, because they'll be going in the oven later. Twist the cord freely until the secondary loops are just about to start forming. You can connect one paperclip to a drill to speed up this part of the process. In addition to fixing the other end so it can't spin, put a weight on it to provide a little tension. Once the first stage of twisting is done, create the second stage by hand-winding the cord around a metal rod (this could be nothing but a paperclip wire, if you want a narrow coil). It is at this point that you must decide whether you want a homochiral or heterochiral muscle. For a homochiral muscle, make the secondary twists in the same direction as the primary twists. If you don't know which direction this is, let a little of the tension on the cord loose, and see which direction the resulting loop goes. For a heterochiral muscle, make the secondary twists in the direction opposite to the primary ones. Keep some tension on the cord as you wrap it around the rod, so that it can't pop sideways to make whiskers or do other stupid things. Slide the coils up against each other as you make them, so they take up a minimum amount of space on the rod. When finished, use alligator clips to secure the paperclips to the rod, so that your muscle can't unwind itself. Heat treatment (annealing) comes next. This process causes the nylon filament to permanently assume the new shape you've given it, so that it won't try to untwist again. I annealed my muscles in the toaster oven. Be careful – if you leave them in there too long, they will melt! It only takes a couple of minutes at 200-300 F to set your muscles (maybe longer if your oven is starting from stone cold, or if you're using a thick rod which takes longer to come to temperature). Once they're done, pull the rod out of the oven with a pair of pliers and dunk it in cold water. Your muscle should slip off the rod easily, and should hold its shape, like a little coiled spring. 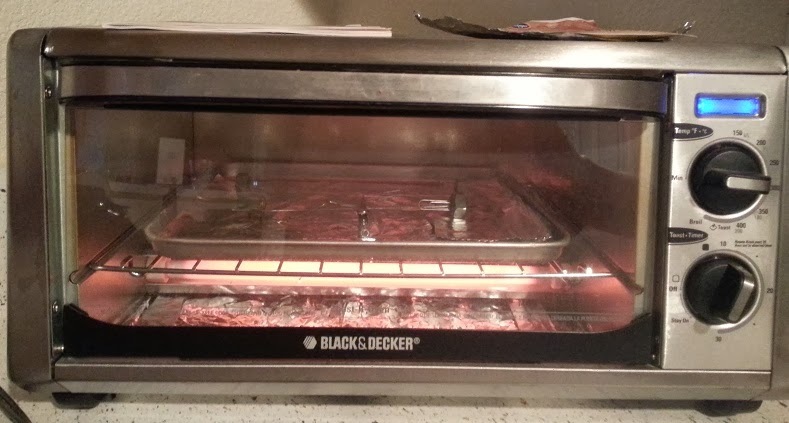 My toaster oven gets to be an engine of Mad Science about as often as it gets to actually make toast. I recommend testing the muscles with a hair dryer or heat gun, if you have one. My only portable heat source is a soldering iron, so I tested with that. It wasn't ideal, particularly because it could be hard to heat the whole muscle at once, but I was able to see a response. My expanding (heterochiral) muscle, which I made on a 2 mm diameter rod, worked especially well. If I held it horizontally and brought the soldering iron up underneath it, so that hot air rising from the iron flowed over the muscle, it would expand and droop. After I took the iron away, it would tighten up again. The contracting muscle, formed around a large unfolded paperclip for tighter coils, also responded, but not as obviously. The main thing that really concerns me at the moment, as regards the practicality of these muscles, is that the temperature needed to activate them seems fairly close to the temperature that causes permanent deformation. I accidentally re-set the coils of both muscles by sometimes holding the soldering iron too close. Be especially cautious if you're testing a contracting muscle with a weight on the end – if it starts expanding instead, you've probably heated it up so much that the plastic has gone soft and is deforming under the weight! Well, that's all for now. Next I'll move on to Phase II – figuring out how to add wires to the muscles and heat them with electric current. I also plan to obtain and test some other forms of nylon monofilament. Nice I tried my hand at coiling some fifty lbs test line during lunch it seems the longer it is the more difficult it is to get it to coil correctly. Me and a friend was doing some initial testing, trying to replicate the results in the paper on the subject. To get the coils right without the "whiskers", it is important to have the correct load. Too low will form whiskers, too high will break it. The paper mentioned 17 MPa so we calculated the weight for our fishing line (350 µm) to be 167 grams. Thanks for the tip! I had weights on mine, but going by the 17 MPa number, they were probably too light ... especially for the thicker lines that I got yesterday. Even the 50 lb. test, 711 um line wants to "whisker," but with a heavy weight at the end it does MUCH better. We did some further testing today and actually got some results! The hot air gun we used to activate the contraction was way to hot so we tried alternating hot and cold water which worked! For this we used a 500 µm fishing line with 347 grams of weight. We will try annealing in vacuum next time we play with this. Good luck! cool to see people testing this out and posting thier findings, the last couple days i've seen more and more diy-er types posting stuff. just wanted to chime in, say thanks. i've started testing today i tried to anneal in an oil (was thinking it might provide a consistent temp), but my filament was too thin, too much heat for too long made it brittle. good luck! I've also been experimenting with this. After a few tries, I was able to reproduce the coiling (I didn't use weights, just trial-and-error with manually-applied tension.) I initially started with a very thing gauge Spider Wire line but I've bought various other mono-filament gauges and I'm trying to find time to experiment with them. In reference to your follow-up post, where you use magnet wire as a heating element--if you're looking to use whatever you've got handy, you might consider stripping some filaments from a non-copper wire. It'll likely be aluminum and should be more tolerant to bending/twisting than copper magnet wire and also have higher resistance (and therefore heat up better.) Plus, the enamel coating on the magnet wire probably isn't helping. 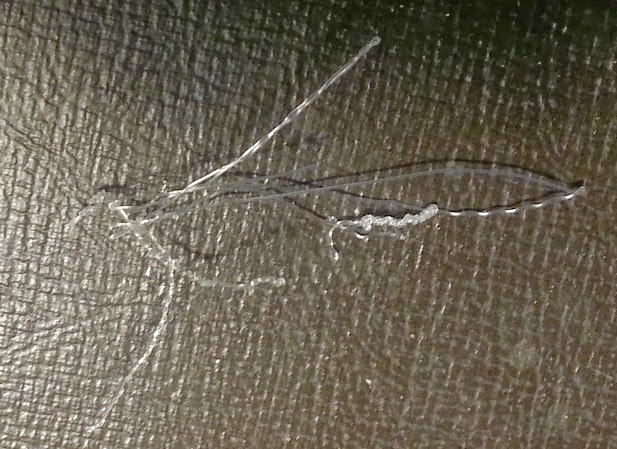 It appears that the University of Texas was using Bekaert Bekinox conductive thread which appears to have been discontinued. Based on SparkFun's listing, it has a resistance of 14 ohms per foot and heats up noticeably when current is applied. I found another conductive 2 ply thread for sale on SparkFun that is rated at 28 ohms per foot, which may be a good candidate. Noting UoT's experiment with thermoelectric heating and passive cooling with water immersion, I envision coiled fibers either made of or with high-resistance conductive thread enclosed in latex rubber medical-grade tubing filled with water as a muscle analogue. 80lb Eagle Claw Nylon6 (Wallyworld) coiled on 16ga fence wire (HomleyDespot). Using two drills (one in each hand) set same direction for coils that contract. 1st drill chucks the line and maybe a toothpick or paperclip to help grip. 2nd drill chucks the other end of the line and the 16ga coiling mandrel. Line can be of any length by running middle around a smooth post. Set both drills for the lowest speed, don't try to control with half trigger. Hold both drills to control tension, but activate only 1 drill at a time. smooth post at the midpoint, and evenly effect the full length of line. armpit or under your foot. loose ends so it won't unravel. Preheat your oven to 300F or 150C. to bake much longer, but I havn't an easy source of inert gasses. I've dared as long as 30min with no obvious benefits or detriment. When you take it out, don't use a wet rag I found the hard way. easily. A wet rag could also break the glass of the toaster oven. So use only dry potholders and try not to touch the nylon. Wow, thanks for all the detailed info! I especially like your data on annealing. I haven't had the time to vary the parameters on that much yet, and I've been paranoid since I melted some of the cheap nylon, so I've been really playing it safe ... 10 minutes or less at 200F. That seems to be enough to set the muscle so it won't uncoil, but it may not be ideal. Nice to know that somebody has gotten one to cook longer at 300F without problems. Correction: My mandrel diameter might have been 14ga. size might work if the enamel was somehow stripped. My mandrel was most likely of mild steel plated in zinc. Zinc plating didn't seem to cause any problems. Observation: Your coils appear larger ratio than mine. I am not yet sure the optimum diameter ratio for Nylon. more like a plastic spring, less like a muscle. Ruined. what it might be doing during initial cold>hot overshoot? goes wrong. I can't get in any trouble with a toaster oven. it seems about right ( for tuna noodle casserole anyway ). My Farber's 300F is right under the melting temp, I think. I should make some attempt to actually measure that. beans. And may get into someplace it should not. That's a really good point -- I have no idea how accurately the oven's temperature reflects what I set the dial to. I don't think there's an optimum coil diameter, until you start designing for a specific application. I suspect that varying the diameter is a way to trade contraction force against contraction distance. I've yet to see a muscle turn white and stiff after quenching, as you describe. I'm tempted to look for that condition deliberately and see if I can duplicate your results. None of my cords explicitly say that they're nylon 6, so it's also possible that they don't have exactly the same properties as the stuff you're working with. In any case, quenching is *not* a step that I expected to add any benefit, it's just a way to cool the muscle more quickly if you're impatient. Letting it slow-cool is probably more reliable. Guys ? Are you heating the coils right after the "spring" is ready ? It looks very very tidy. 1. Do you uncoil it before heating ? 2. Do you uncoil it a little before putting to work ? I'm doing my coil with 1mm fishing line and 0,5kg. I replied to your YouTube comment, but I'll go ahead and leave an answer here too. The lines are annealed while coiled. This fixes the shape, so they don't get uncoiled before being put to work either. However, the coils do spread apart somewhat when the muscle is put under load, which gives the muscle space to contract. When did you put a rod ? When coling or after that process ? When making the rod-coiled muscles, I used a drill to twist the line until it was just about to start forming secondary coils, then freed one end of it and hand-wrapped it around the rod. One of the commenters above describes using two drills, but the procedure is still basically the same: use one drill to twist the line, then turn it off and use the second drill to coil the line around the rod. So I guess you could say that the rod is introduced in the middle of the coiling process, after primary twisting/coiling, but before the formation of secondary coils. Thanks. I've spent almost 2 days to find better way of doing coil with rod (to make it more noticable). So there are few tricks I have found. Maybe you will find usage of it. 1. Instead of weight use ... TURNSTILE to keep the tension. I can put my drill and turnstile in fixed positions. With proper brake set on turnstile coling is very easy for me. Turnstile is releasing slowly another parts of fishing line. With it I can produce required lentgh of the coil. That's brilliant ! Note here. Twist it opposite to clock wise ! You will find why in point 3. It matters only if you are trying to put a rod in my style, but I don't know yet how effective it is. 2. At the end of coiling process I'm just cutting off coiled fishing line closer to turnstile and slowly releasing a twisting tension from it. Simply I'm holding the end of the coil between fingers and control it this way. I counted that after tension is released the coil length is reduced to about 65,5% of initial coiled line (from 26cm it went down to 17cm). I guess that radius is 65,5% larger in the same time but didn't check it. After extra tension is released the coil is "steady" and will not uncoil to the straight line. It is still coiled and it's still very tight (no spaces between coils) but at least you can stretch them out and see the work and it works like a spring. To much stretching can however make it uncoil. 3. I've decides to put the 2mm rod inside. The best for rod was my SPOKE from the old bike. 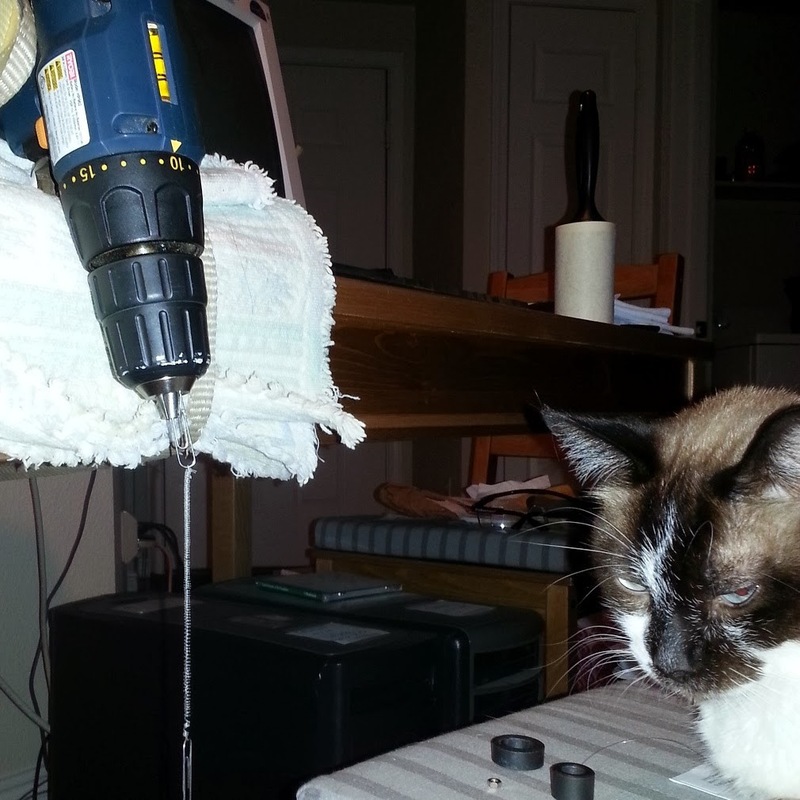 - Cut it out near the gears, put into drill, hold it on top with some key/pliers and ... unscrew it. Brilliant ! - Make it like a NEEDLE on the threaded side, but don't destroy all thread. You will need it. It will pull the coil on the rod when rotated inside the coil. Another brilliant idea :D which work for me quite good. Not perfect but works. - Put your coil on it and drill inside it with your drill. If you have troubles with start inserting the rod use large needle to make a space. The rod's thread must be same direction as your coil. That's why I twisted it opposite to clockwise to match coils thread with spike's thread. If you will do it opposite way (clockwise) it will be impossible to put the rod. Simply it will block it self on the rod. Turnstile? Do you perhaps mean some sort of reel with a friction brake? of torsion? Are loops coming off this "turnstile" twisted or untwisted? I have been pre-twisting my entire length of line (with the 1st drill). I'm not sure if "turnstile" word here is a good. I'm not native english speaker. Maybe "Fishing reel" is better - this thing attached to the fishing rod to store fishing line on it. It works perfect with proper tension. They are comming off twisted. Anyway everytime i tried coiling begins near to drill. Maybe we could do both operations with just one drill. If the mandrel had an eye in the far end for torsioning. the drill. Would we reverse the drill this point or not? My idea is too attach "turnstile / fishing reel" to the drill - it requires some work and tools to do that. So drill would turn "turnstile / fishing reel" around its own axis and "turnstile / fishing reel" is releasing fishing line with proper tension. The beginnig of the fishing line it's just attached to some rod on which you can wind tensioned fishing line or already coiled to make it longer. the line and keep the drill pointed toward the pull. eyelets, only slight different in purpose. over and off easily, after bake, without cutting. original length just before it begins making knots. I can't just slip my coil off the mandrel when done. use the drill for this operation. Wasn't difficult. If your drill has a torque setting, might be wise to use the lowest. Absolutely nothing we are doing here needs big torque or speed. My drill is crazy overpowered for torsioning and coiling a fishline. I got several four-eye'd mandrels loaded into the kebab rack now. reach of the tools you left back at your starting point. you, or place a second pair where you expect to finish. the line before twisting it. I wiped that off before baking. I only marked a few inches nearest the drill. of the mess revealed the half hitch was still present. But had loosened just enough to slip over the eye. the half hitch I actually wanted for the final product. Also had a drill battery run out at a critical moment. I (wandering about) gave some samples at Frisco Maker Faire. Without a booth or actual demonstration, wasn't much interest. obsessed on their own projects as-if the center of the universe. Now that I can make batches of these to a consistent pattern. What we need are applications that demonstrate the potential. was filled with wax? Anyways, our Helix is filled with more Nylon. helix and a coil helix to have any useful thermomuscle action. disorder the internal arrangement of filaments. The article and comments were extremely helpful! I'll be testing these in the near future as an attempt of creating prosthetics. Thanks for the information and i'll post my results when I finish. Based on what I have tried. Some pretty impressive achievements there.